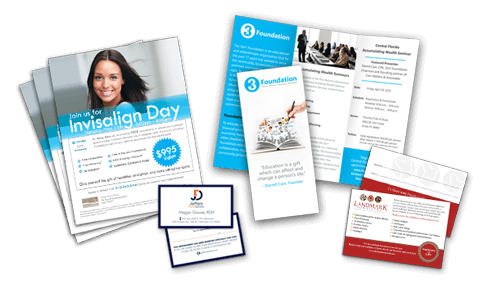 Whether your practice is new or established, having the right marketing materials is crucial for creating brand recognition, conveying professionalism and attracting new patients. At SmileMore Marketing, we create logos that express your culture, personality and quality of care. Using complimentary colors, fonts, and design elements, we then apply your new logo (or your existing logo) to a variety of products including appointment cards, referral cards, business cards, letterhead, envelopes, brochures, and mailers to make your brand complete. LET US TAKE IT FROM DESIGN TO DOORSTEP. Once your artwork is designed, our team manages the printing process so you can focus on your business and your patient care. Browse the SmileMore Marketing Shop to see the marketing materials we frequently create. Don’t see what you’re looking for? No problem. Tell us what you need and we’ll help make it happen. Already have an established look? We can customize your new pieces to be cohesive with your existing brand. Our volume discounts give you access to qualtity paper and printing without breaking the bank. SmileMore Marketing creates original and completly customized artwork and messaging so your materials are exactly what you need for your target audience.